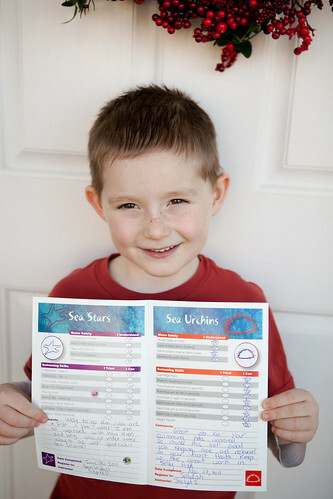 Kai had his last swimming lesson today and is officially a Sea Urchin. He was pretty proud of himself and I'm happy for him. Sea Urchin is just the second level and it's where they have to completely submerge themselves and do assisted front and back floats (he can do an unassisted back float). Not too exciting but he has come a long ways. 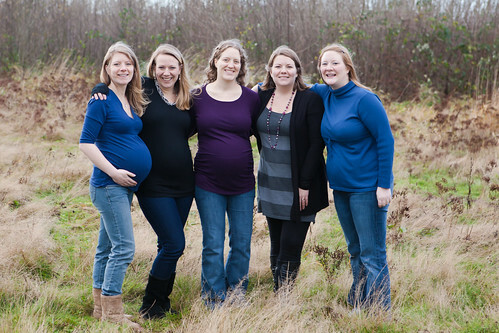 This weekend we got some pictures of all the sisters together and then also some of the 4 pregnant sisters. I'll have to post them later, there are some cute ones! Must edit client photos first....We found out what another one of my sisters is having (already knew that Trish is having a girl) and I'm so excited and shocked as I was completely wrong:) Not sure if we are allowed to share that news so I'll keep it to myself for now. My belly has taken a break in the growth department so that's good:) I still get really, really bad headaches that bring on the worst feelings of nausea that last about 24 hours. I'm thinking it's mostly related to being overtired but I'm not sure. It happens about once a week. I've realized this baby is going to cost us a lot of money! Usually I borrow a ton of stuff from my sisters but I can't this time around (nursing pillow, pump, bath, exersaucer) and also our baby car seat expired and someone stole the stroller that went with it. Also, I'm going to be buying a new white dresser (probably the Ikea Hemnes one) as we are completely re-doing the baby room:) I'm excited about that part! We put up our Christmas tree and I like it. We don't do a ton of decorating but I like the simplicity of what we have. Gary just needs to put up the lights as I'm not going to attempt it this year. I love having Gary home on the weekends as I don't need to make a single meal. This weekend he made some fantastic french toast using croissants and yummy salmon cakes/patties (salmon/mashed potato etc). We both really, really love food. I think for Christmas, instead of getting each other presents, we will just use that money to go out for a fancy dinner and not feel guilty about it. Can't wait to see more pictures of the pregnant sisters! I've been having headaches too!!! they come and go, but on average probably 3 times a week. They aren't that bad, but a total bother. Submerging his head is SUCH a big deal, as are the unassisted floats! Awesome Awesome Awesome! Oh, its just the beginning! YAY!!... Thats super exciting to me. Makes me miss teaching swimming. Love the picture of the sisters. BEAUTIFUL! You can borrow some of our stuff as we won't need the bath, exersaucer, or baby play mat. Cute one of the 5 of you - and now I'm totally curious about what your sister is having. Diddo to Carol's comment! :) And next time, we should get a violin and guitar and pretend we are like the Dixie chicks...I think that would be fun ;). I do have a mini electric pump that you could borrow if you want.